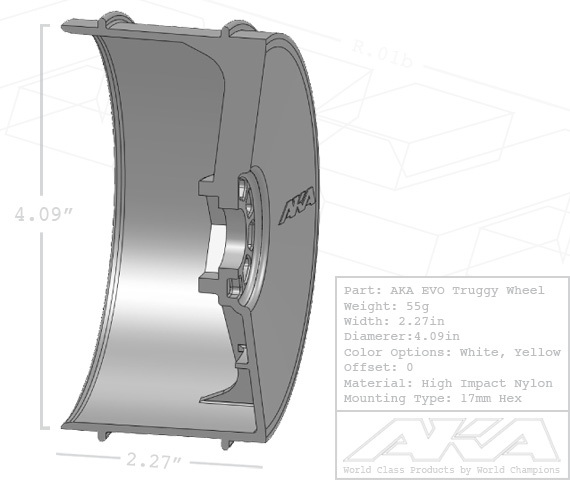 The EVO Truggy wheel is modeled after our World Championship winning EVO Buggy wheel. The wheel features a convex face to help stiffen the wheel and add additional protection to the outside face. The EVO wheel has been designed with the new ROAR 1:8 Truggy wheel bead. This new bead is a much simpler design and promotes a stronger bond between the tire and wheel. The optional internal disk offers two benefits. The first is stiffness. With the disk installed the wheel will be stiffer which isvery desirable on tracks with large jumps, high traction, high speeds or high ambient temperatures. The second benefit is balance and weight. With the disk installed dirt cannot buildup inside the wheel and throw off the balance and add unwanted rotating mass. Last but not least the new EVO wheel is 6.5% lighter than our current wheel.